For outdoor enthusiasts, few activities will provide an adrenaline thrill like whitewater rafting. Navigating rapids while zipping through the river is a thrill for even the seasoned adventurer. And the best part of this sport is that it can provide something for rafters of every experience level. As the weather starts to cool, now is the time to plan one last rafting trip before the temperature gets too low. If you're a relatively new rafter or have never before hit the rapids, use these tips to plan a trip that will be both fun and safe for you and your friends. Whitewater rafting doesn't necessarily need to be a dangerous experience. But to achieve a successful trip, you need to put safety first. No matter your experience level, you should always wear a life jacket and helmet. These pieces of equipment will protect you if you accidentally fall out of the raft. Location and conditions are also important safety considerations. USA Today recommended rafters consider the weather and time of year before finalizing a trip. These two factors can have a huge impact on the amount of water running through the river. And the more water you have in a narrow space, the bigger the rapids you'll go over. Afraid that you may be setting yourself up for failure? If you're a beginner rafter attempting a trip on a river that you are not familiar with, consider hiring a local guide. At the very least, check in with shops in the area that cater to outdoor enthusiasts. Staff members will likely be familiar with the conditions of the river and know whether the rapids are going to be too much of a challenge for a new rafter. 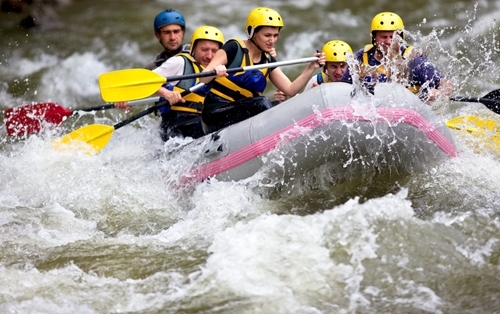 You don't have to be an adrenaline junkie to have fun on a whitewater rafting trip. You just need to make sure that you pick the right adventure level. Rivers are rated on a class scale from one to six to help rafters choose appropriate destination. Stick with levels one or two if you want something easy. Mark Chesnut, editor and founder of LatinFlyer.com, reported that he was able to survive levels one through four on his first whitewater rafting trip. Again, if you aren't sure what level to choose, check in with local rafters to get an expert opinion. While this probably goes without saying, it bears repeating: wear clothes that you can get wet in. Even on trips that aren't as intense, you'll likely get wet. Wear shoes and clothes that won't become uncomfortable if they get soaked with water. Make sure that other possessions like your camera and watch are also waterproof. A water-resistant Pro Trek solar powered watch is a great option for a white water rafting trip. The built-in watch compass will be useful if you need help with directions and you won't have to worry about it being washed overboard. Protect yourself from the elements and wear a PRG300-1A2. It is water resistant up to 100M and is tough solar power equipped. Next time you go whitewater rafting make sure you don't leave without your Pro Trek.